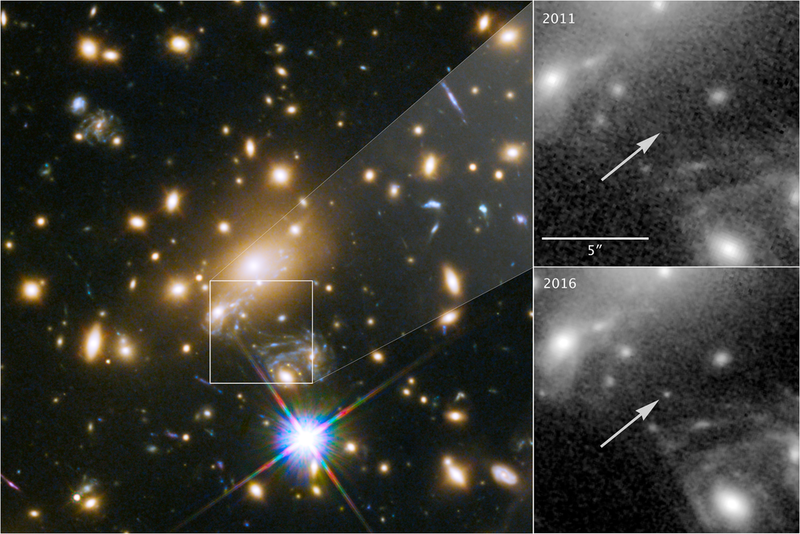 Thanks to gravitational lensing, the farthest individual star ever seen was captured by the Hubble Space Telescope, compared to previous images where it was indiscernible at right. NASA, ESA, and P. Kelly (University of Minnesota). There’s a new star you can wish upon called “MACS J1149+2223 Lensed Star 1,” or as astronomers are calling it, “Icarus” for short. Icarus is the latest discovery by the Hubble Space Telescope and it is over 100 times farther away than any star ever seen clearly as an individual rather than as part of a galaxy mass. Scientists calculate that the observed light from Icarus was emitted when the universe was only 4.4 billion years old and traveled nine billion years to be observed today. NASA and ESA (European Space Agency) published their findings on Monday, April 2 in the journal Nature Astronomy.